We’re not sure about you, but just planning your next vacation seems to take as long as the vacation itself. You want to make sure you visit the best places, eat at recommended restaurants and make the most of the destination. It’s hard to find a comprehensive app which contains everything you might need to plan your route, timeline and distances from your hotel. If you’re on a tight schedule, say a weekend away in a new city, it’s really hard to get this route wrong and walk long distances to get to your destination. Luckily, we might have found the ideal solution. Google Trips is a free app that compiles all your personal travel info (tickets, reservations, etc.) and combines this with top spots to work out the best places nearest your hotel to visit. Trips utilizes Google’s analytics to help you plan your route based on your interests and how much time you have in your area. All this information is contained within an easy to navigate app and the info is made available offline if you struggle for a 3G/4G connection at your destination. Google Trips will handle all your travel needs from start to finish. Once you’ve booked your trip and you’ve received all your ticketing information to your email (preferably Gmail for analytics to do its work analyzing your destination), Trips works its magic. It can locate your tickets and information from your email inbox and then, beyond that, what it does can prove to be incredibly time-saving. Trips finds and places all your reservations in one location, including tickets, hotels, hostels, so if you click on an upcoming flight it gives you the times plus the terminal and gate if available. It will also keep your confirmation email and link it to the email where Google found it. Once you arrive at your destination, Trips offers information on how to get to the city center by various modes of transportation and gives you the estimate of price for taxis. 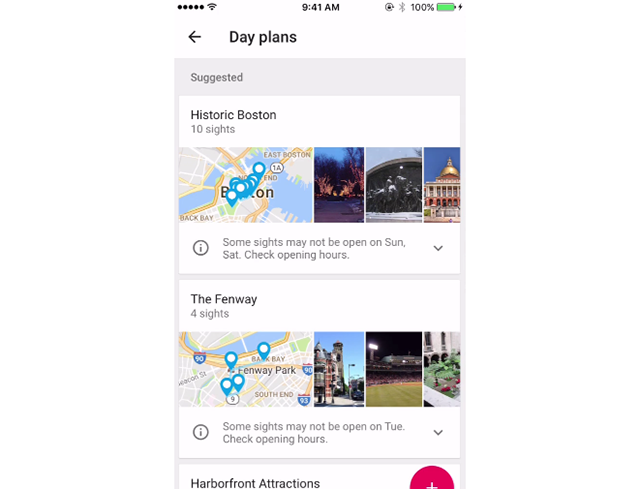 In certain cities Google Trips will also add other information such as mass transit, and how to get between your location using the subway or metro. Another great feature is the "Things to Do." Again, by compiling user data and reviews the things to do section lists the top things to see in the city and the best options to see near your location and offers you personalized recommendations. Based this information, Trips also feeds you with crowd-based reviews to find you food recommendations. Additionally, the Trip app offers an itinerary/day plan based on the top things to do and the amount of time you have in the city and will also categorize this based on your trip such as if you’re traveling with kids. As you add and remove ideas you like, it will change the time to suit your schedule. So, if you don’t feel like doing certain suggestions simply remove them and the app will plan a trip out for you in a certain time frame, which you’ll be very interested in achieving. While all of this sounds exciting, it is yet to include to several cities. Although it is by Google, even they do not yet have all the cities in the world ready for your exploration. But it is growing fast and we’re excited to see what cities are added next! Download Google Trips for iOS and Android.